Ontario Craft Beers' Most Influential Women Gather in Guelph for Roundtable Discussion. 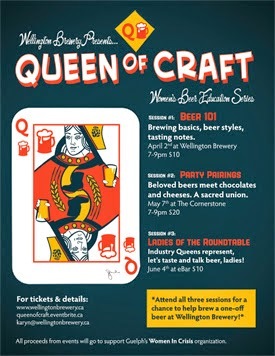 Wellington Brewery's Queen of Craft Women's Beer Series will hold it's final session this upcoming Wednesday, June 4th at the eBar, bringing together 10 influential women in the Ontario craft beer industry for a round-table discussion. Each woman will talk about her experience in the industry, guide participants through a beer tasting and answer questions from the audience. All proceeds from this series support Guelph-Wellington Women In Crisis. Helen Sheedy - Territory Manager of Muskoka Brewery, discussing the opportunities for women in the craft beer industry. Carmen Vincente - Brewer and Sales for Bellwoods Brewery, discussing small-batch brewing and the secret of Bellwoods success. Shelley Biernes - Gilberston and Page, discussing home brewing basics. Crystal Luxmore - Beer Columnist and Certified Cicerone, discussing the trials and tribulations of working as an independent beer writer in a co-dependent craft beer scene. Sarah Dawkins - General Manager of Wellington Brewery, sharing stories from the top. Nicole Hynes - Owner and Founder of Sweetgrass Brewing, discussing the upstart of a microbrewery. Erica Campbell - Manager of Black Oak Brewing, Co-founder of the Society of Beer Drinking Ladies, discussing the importance of beer groups for women. Erica McOustra - Head Brewer at Steamwhistle Brewing, discussing large-scale brewing techniques. Robin LeBlanc - Award-winning writer and owner of The Thirsty Wench, discussing beer-blogging. Brandi Lee McDonald - Co-founder of the Because Beer Festival and Certified Beer Judge, discussing the world of judging beer, how-to and why?